I again attended the 2007 Historic Farm Days in Penfield Illinois today. It was a perfect day to see all the beautiful John Deere Green machinery. Each day there is a parade and today was no exception. The parade was almost an hour and 45 minutes long with the green leading the way. The parade also featured many non John Deere tractors, construction equipment and trucks from the Kickapoo chapter of the American Truck Historical Society. Glenn Miller's 1955 Farmall 300 pulling a 1948 McCormick reaper cut a five-foot swath through a wheat field Friday with dozens of spectators watching. 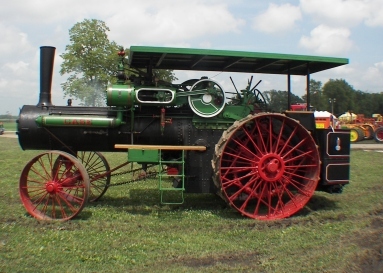 Miller, a 76-year-old Seymour farmer, had heart surgery seven weeks ago, but said he was determined to recover in time to bring his antique equipment to Historic Farm Days, a show that continues through Sunday at Penfield, headquarters of the I&I Antique Tractor and Gas Engine Club. "I've been collecting about 15 years," Miller said. "It's a little bit of history. When I was in school this is the kind of equipment farmers used. I begin to realize my age when I realize how much I know about this old equipment." Miller and his son, Greg, restore their equipment themselves but Miller said he likes to build, not repair, so he leaves that work – and the painting – to his son. "We collect both red and green, and I've farmed with both," said Miller of the predominantly green – John Deere – theme of the show this year. Tomorrow the 2007 event wraps up.